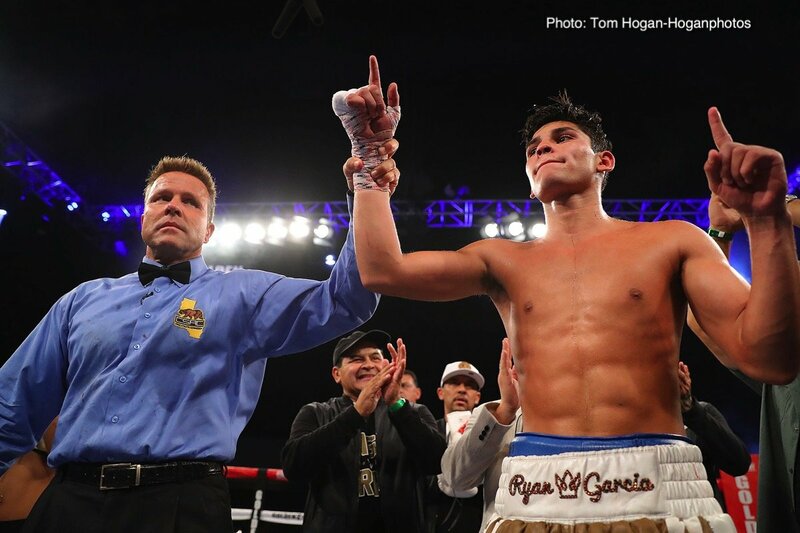 Ryan Garcia (16-0, 13 KOs) stayed undefeated with 10 round majority decision victory over Carlos Morales (17-3-3, 6 KOs) on Saturday night in the main event at the Fantasy Springs Resort Casino in Indio, California. The fight was streamed on Facebook Watch and on Golden Boy Fight Night Page. If you’re a Garcia fan, you have to be more than a little disappointed in his performance. Garcia was rocked in round 7, 8 and 9 by big shots from Morales that caused him to go Bambi-legged, forcing him to hold on to keep from getting knocked out. Garcia showed good ring intelligence to know when to grab Morales in a clinch to keep from getting knocked out, but the fact that he was getting hurt so often in the second half of the fight was bad news. The boxing fans booed Garcia after the fight. That’s not good, because these were his fans, not Morales’. When your own fans boo you, it’s a sign that you’re not doing something right. Garcia was trying to knock Morales out with his speedy shots, but he didn’t have the punching power to hurt him. Garcia was trying, but the power wasn’t there for him. The net effect of Garcia trying so hard to score a knockout was him getting tired early, and then struggling in the last seven rounds from the fast pace that Morales was setting. Garcia started off well in the early rounds, but then faded in the second half of the contest. By the 10th, ‘Kingry’ Garcia looked exhausted and spent. It was lucky for him that the fight was scheduled for just 10 rounds, because he would have been in danger of being knocked out. The scores were 98-92, 95-95, and 98-92. Garcia got the win. The fight looked close enough to be scored a draw. Neither guy did enough to deserve the victory. That’s not a knock on Garcia, even though he came into the fight as the favorite to win. He’s only 20-years-old, and he did an admirable job of fighting Morales to a standstill tonight, but he didn’t beat him. The judges gave Garcia the win, but he didn’t appear to win the fight. It was an even fight at the end in this writer’s opinion. In fairness to the judges that scored it 98-92 for Garcia, many of the rounds were close, and were hard to score. However, Garcia was hurt in three of the rounds, and he appeared to lose to lose at least two other. That’s five rounds that Morales fought well enough to win, but the judges didn’t give him credit for getting the better of Garcia. The win for Garcia wasn’t the type of performance that he needed to show to let his promoters at Golden Boy know that he’s ready to be stepped up against a better fighter from the super featherweight or lightweight divisions. Garcia, 20, says he wants to fight Gervonta Davis. If Davis had been inside the ring tonight with Garcia, he would have likely knocked him out by round 3. It wouldn’t have been a fair fight. Garcia would have likely lost to Christopher Diaz, Francisco Vargas and Robinson Castellanos tonight. Those are all contenders in the super featherweight division. Even an old lion like Yuriorkis Gamboa would have been a major problem for Garcia. He’s not ready for good contenders in my estimation.